Another storm has swept through the southern states and is currently impacting the East coast. Much as Octavia did two weeks ago, Thor came in the night and left commuters and delivery companies alike to deal with its mess. The snow has forced many companies to call off operations for the day, however, as winter advisory warnings go up around the Northeast and New Jersey has declared a state of emergency. Capacity is up and running despite this latest dump of the white stuff, while carriers are shutting down in some areas, struggling to stay on top of the deluge. Severe weather in Louisville, KY caused a significant disruption to operations at Worldport®, UPS’s main hub in the United States. As a result, some shipments may experience unavoidable delays. UPS is working to move shipments to their final destinations as quickly as possible. One bright spot of this particular storm is that some believe it’s the last one for this winter. Whether or not you believe the weather men and women, two things are for sure: the clocks go forward for spring this weekend and the seasons officially change in two weeks time. We’re no softies when it comes to snow, but everyone will be cracking a smile as the sun starts to shine again and temperatures rise to melt all this white stuff. Until then, keep on truckin’! Continuing where we left off yesterday, the inability to provide Valentine’s Day flower deliveries snowballed into quite a media storm over the last 24 hours. And as the big day dawns, opinions seem to be varied as to just how well florists will be able to meet delivery demand today. Over at CNN’s Fortune, the impact of snowstorm Pax is thought to be limited because the flowers have already arrived in the country and been cut, ready to order. Everyone knew that the storm was coming and most have made alternative delivery arrangements, whether before or at some point over the hastily adjusted “Valentine’s Weekend.” The adverse weather is a mere inconvenience at this point, they suggest. The Washington Post, however, sees a much more difficult day ahead for florists desperate to make the most of the biggest day for their business. Their report tells of owners desperately making deliveries themselves, seeing every one as an opportunity to offset some of the inevitable lost sales. Online orders also seem to be a mixed bag… bouquet. Proflowers is sticking to the message that we reported yesterday, accepting no new delivery orders because of the storm. 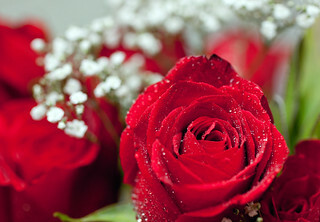 But main rival 1-800 Flowers seems to be sticking to business-as-usual, with Valentine’s Day delivery orders being accepted up to noon in each time zone. And amid all of this weather confusion in the East, it’s perhaps comforting to know that the discussion on the West coast sticks to a good old-fashioned moan about exploitative Valentine’s pricing. The truth will out over the next 12 hours or so as to just how much impact the snow has on flower deliveries. If you’re looking for a last-minute bouquet for your sweetheart on the East coast, though, we’d suggest getting a shovel and digging on over to your nearest store. Nothing says I love you like a five-hour trip to the florist!